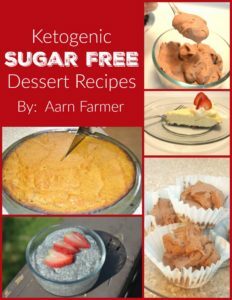 The Ketogenic Dessert Recipe ebook is finally here! I know I’ve been promising this for a while but I wanted to make sure it was perfect before I released it. In fact, I enlisted Dian’s help on the layout so if you think it looks pretty, let her know! This book has 7 fantastic low carb, high fat desserts that are totally sugar and grain free and are perfect for a LCHF or Ketogenic diet. They are all very easy to make and taste awesome! Keto Ice Cream – Want a tasty frozen treat that won’t knock you out of ketosis? This is the one for you, plus it comes with a bonus recipe for Magic Shell because that’s my favorite ice cream topping and it took me forever to figure out how to make something that hardens when cold, is sugar free and still tastes great. Keto Chia Seed Pudding – All I can tell you about this is it is toddler-approved. My picky granddaughter can’t get enough of it. Keto Chocolate Mousse – This is our go-to dessert when we want something tasty in 30 seconds or less. Keto Pumpkin Pie – Can’t have Thanksgiving without Pumpkin Pie! I’ve got 2 different ways to buy this. You can buy this book alone for $2.99 by clicking here or you can buy both the Dessert recipes AND the Breakfast recipes for $4.99 total PLUS that 2 book bundle also has an option to buy a 30 minute phone consultation from me for $10 less than the normal price. Obviously, that’s the better deal. To get the 2 book bundle with optional phone consultation, click here.